The book I discuss in this post is not a crime novel, but the history of its discovery and attempts to identify the author is a detective story. In 2001, Professor Henry Louis Gates, Jr., chair of the Afro-American Studies Department at Harvard University, discovered a holograph in the Swann Galleries catalogue that would change African American literature, especially our ideas about fictional slave narratives. The Bondwoman’s Narrative was published in 2002 by Warner Books and edited with introduction by Professor Gates. The manuscript had never been edited by a professional editor or ghostwritten by a white person as many of the fictional and nonfictional slave narratives were. If the manuscript could be authenticated and the author’s identity confirmed, the novel would prove to be the first written by a former female slave in the United States. The novel itself and the efforts of several scholars to establish the author’s identity make discussion of this fascinating book difficult. A detailed discussion of the novel is necessary to examine the strengths and weaknesses of plot and characterization and the historical context. So, I discuss it only briefly. The effort of scholars to verify the author’s identity is a literary detective story deserving its own critical analysis. In his brilliant and illuminating essay “The True Story of American’s First Black Female Slave Novelist” on the New Republic website, Paul Berman discusses in-depth the novel and the efforts to prove the author’s identity. 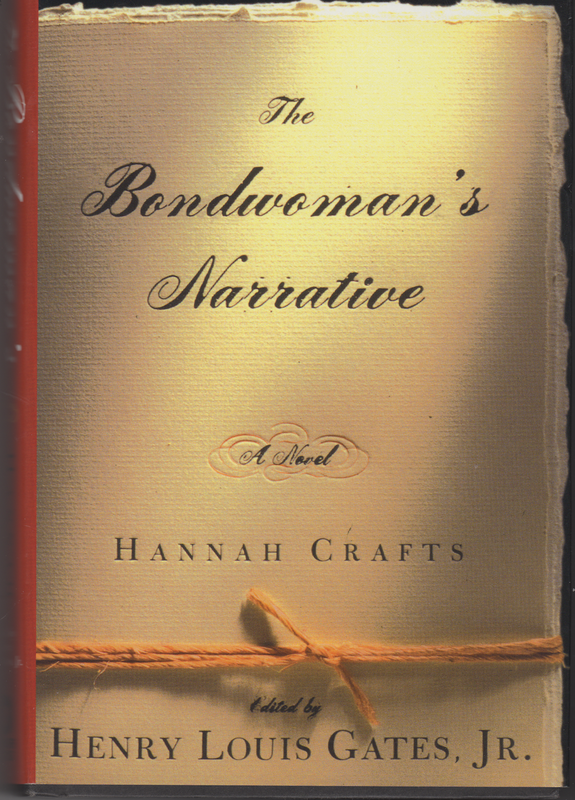 The Bondwoman’s Narrative by Hannah Crafts: A Fugitive Slave Recently Escaped from North Carolina is the full handwritten title on the first page of this important black sentimental novel. Hannah, the literate narrator / protagonist, tells the story of her escape from a plantation in Virginia, her capture and resale to the Wheelers in North Carolina, and finally her escape to New Jersey. Aunt Hetty, an old white woman who lived near the plantation where Hannah grew up, defied the law and taught her to read. Like many slaves who learned to read and write, Hannah knows the Bible and begins each chapter with a biblical epigraph. Her tendency to philosophize shows she has read widely. In the philosophical tone she displays throughout the novel, Hannah seemingly accepts her condition: “’I am a slave’ thus my thoughts would run. ‘I can never be great; I cannot hold an elevated position, but I can do my duty, and be kind in the sure and certain hope of eternal reward.[']”. She is also a perceptive observer of people: “Instead of books,” she “studied faces and characters, and arrived at conclusions by a sort of sagacity that closely approximated to the unerring certainty of animal instinct.” This talent for wearing the masks to conceal her feelings and thoughts from the masters, which many slaves learned to do, allows her to adjust to the different circumstances in which she finds herself. The former slave clearly mastered the techniques of novel writing that made her an exceptional storyteller. She reveals the effect of slavery on master and slave, especially how supposedly kind masters supported the peculiar institution. In the preface she asks, “Have I succeeded in showing how it blights the happiness of the white as well as the black race?” My reply is a resounding yes. The efforts of several scholars to identify the author is a detective story as exciting as the novel. As Timothy Davis writes in Salon, ink and paper experts helped Professor Gates establish that the novel was written in the 1850s. His analysis of the prose revealed the author was familiar with and borrowed from Jane Eyre and Bleak House. Unfortunately, he was unable to establish her identity. Once the novel was authenticated, the detective scholars went to work to solve the mystery: Who was Hannah Crafts? An article in the New York Times dated September 18, 2013, claimed that Professor Gregg Hecimovich, chairman of the English Department at Winthrop University in Rock Hill, South Carolina, had found additional evidence that revealed the author was named Hannah Bond, a slave on the plantation of John Hill Wheeler in North Carolina. Professor Hecimovich planned to publish his discovery in a book titled The Life and Times of Hannah Crafts. The novel is important because, as Professor Gates writes, “Holograph, or handwritten, manuscripts by blacks in the nineteenth century are exceedingly rare…” Rarer still are ones that haven’t been ghostwritten or edited by a white writer or editor.